A question I often get asked by new watercolor artists who are struggling with their watercolor painting techniques is, “How wet should their watercolor paint mixture be?” Another is, “How wet should their watercolor paper be?” Paint wetness seems a simple enough topic but it can give newcomers to this art a lot of grief. These are very simple questions and should definitely be asked by every watercolor artist. The challenge, however, is how to answer them! I am going to have a go at coming up with a way of looking at this which is both simple to understand and easy to apply. Experienced watercolor artists have solved this issue, usually with lots of practice, but paint wetness can be quite difficult for new artists to understand. 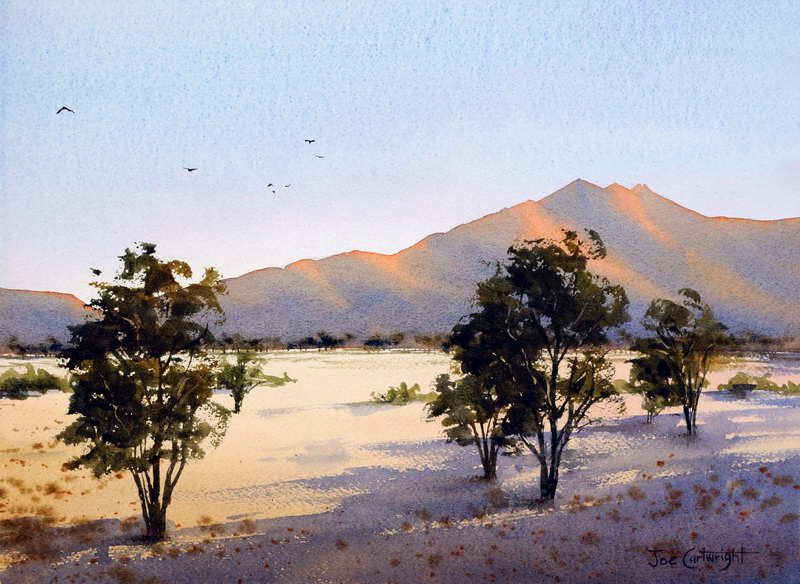 Why is this question so important to answer and understand for watercolor artists? Well, the consistency of your watercolor paint, and the wetness of your watercolor paper, combined with your brush handling, and an awareness of how fast everything is drying, will determine just what type of edges you will create when painting. All effects from very soft wet on wet to hard edged wet on dry and all the variations in between depend on this. Even dry brush strokes are influenced by the consistency of your watercolor paint and the wetness of your paper. It is at the core of most watercolor painting techniques. Why is Paint Wetness hard to define? Firstly, most books and articles on watercolor painting will use words like “create a weak mix” or “mix a strong mix” when referring to a particular mixture of watercolor paint that will be used for part of your painting. The problem here is, “Just what is a weak mix or a strong mix?” For a beginner artist or even for quite experienced ones this does not really tell you very much as a weak mix for one may be considered a strong mix for another. Combine this with how wet your watercolor paper is and the whole topic become more difficult. The problem breaks down into two sections: the first is definitions of terms and the other is the complexity of what is happening on your paper. Some books, like an excellent one on watercolor painting techniques written by Australian watercolor artist Joseph Zbukvic, have tried to use terms like coffee strength and tea strength mixes to help define a particular consistency. I found this quite helpful but it still creates some confusion for some students. It all comes back to degrees. Just how strong is coffee strength or tea strength watercolor mixtures. Some people take their coffee with lots of water (weak) and others with less (strong). Not everyone drinks tea and again its strength can vary. So obviously, while this is a useful scale, it can still cause confusion in a beginner watercolor artist. This confusion is further compounded because a particular mixture strength will react quite differently on your watercolor paper depending on its wetness. OK, so how to try and tackle this problem. Well firstly, what we can say for a fact is that just plain water can be considered your weakest mix and paint directly from the tube with no water on your brush or paper is your strongest mix. So obviously if you are someone that finds it difficult to mix a dark color then in some way you must be adding more water to your mixture than you need to. This water can come from various sources. Most often it comes straight from your water container into the mixture on your pallet and all you need to do is use less water. Sometimes however it occurs through the bad habit of cleaning your brush each time you want to pick up more fresh paint. This is rarely required but if you do need to clean your brush, because you need to pick up some really clean color, then make sure you dry it on a cloth after cleaning and before you go into the new paint. It is also possible that you are picking up wet paint from the bottom of your paint well where water may have already accumulated. Finally you may be painting onto paper that is too wet – though this is not so common. I suppose one could try to define the consistency of watercolor paint scientifically such as “this much volume of paint for this much volume of water” but really when you take the wetness of your paper into account this system would not be any more useful that by referring to mixtures as being similar to cream strength or milk strength etc. Overall these systems for describing how wet your watercolor mix should be are at best a guide and I don’t think one can be more accurate than that. So where does this leave the budding watercolor artist already struggling with a whole collection of art terms and techniques? My students still need some guide! I think that rather than thinking of comparisons with things like milk, coffee, cream, etc. or using terms like strong or weak watercolor mix, one should first look at how a landscape watercolor artwork is constructed. In a landscape watercolor painting you start with the big shapes and then progress to smaller ones. Your first watercolor wash is usually the sky which in most cases is the lightest part of your painting (apart from highlights or objects actually painted white). Notice how I use words like “usually”, remember there are no absolutes in this world of watercolor painting, or in life for that matter. All these “rules” are just guides as one can “usually” find an exception to all “watercolor rules.” Don’t be afraid to experiment when it comes to watercolor painting techniques. Just because something can or can’t be done one way doesn’t mean it can’t be achieved in another. For years I never used a fan brush with my watercolor painting as it was rarely mentioned in watercolor books but now it has become a critical part of my watercolor equipment. 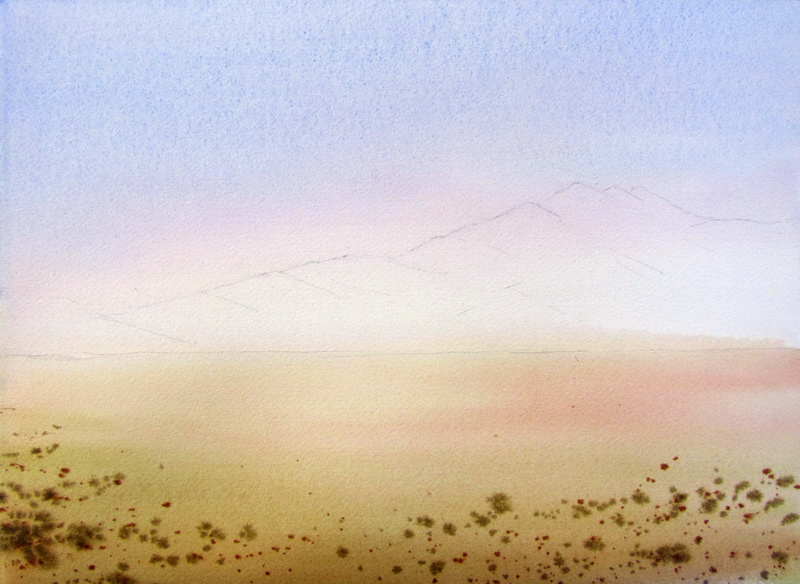 Now after the sky you would continue your watercolor wash down to the distant ground and on to the foreground. The distant ground will have more pigment than the sky above and the foreground would have more pigment in your watercolor mixture than the distant ground. So you can see that by thinking this way you don’t have to compare your mixes with anything other than how strong a mix you used for your sky and other parts of the painting you do after that! In a way everything flows from this first step. Now once your sky and ground are totally dry you will see that you already have a watercolor landscape painting before you. If it doesn’t look right at this stage the rest of your watercolor painting won’t work! Think of it as laying the ground of your landscape painting upon which you will paint hills and trees and animals. The next step is to paint the distant hills. So what consistency paint do you need for this? Well vertical shapes are usually stronger in tone (more watercolor paint to water ratio) than the horizontal objects near them in their space. For example a tree is usually stronger in tone than the ground it is on! For this reason when I start a painting I generally mix more paint than I need for my initial wash. In this way after I lay down my under painting I have plenty of paint to use as the basis of the following watercolor washes. So for the distant hills I would add more paint to my sky mixture in my palette and I use this for the hills. Now obviously I would use additional colors but more importantly in adding these colors I am increasing the strength and hence the tone of my mixture. This will ensure that my hills sit in their correct position in the picture plane. 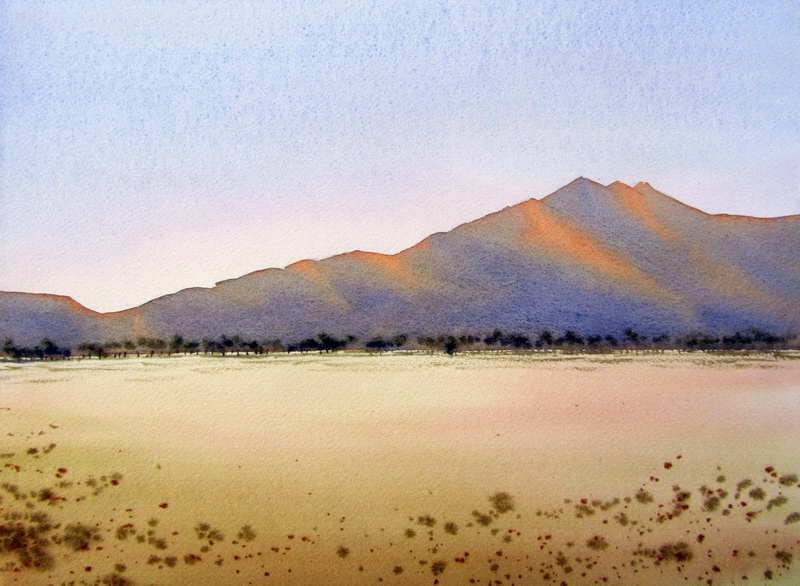 Figure 2: Watercolor painting of distant hill which is stronger in tone than distant ground. The same process would generally be used when painting the distant trees and foreground objects such as bigger trees, grasses and shrubs. So an important watercolor painting technique is to compare the consistency (strength) your watercolor paint mixtures with the mixtures you have already used in your PALETTE. Depending on how light you start with your sky will determine how strong you need to go with the rest of your watercolor mixes to achieve a watercolor painting with a feeling of space with all objects in their right place in the picture plane. By playing around with your sky mixture you can influence the range of tones within your watercolor painting. There is no right or wrong, it is more a matter of personal taste. However, if you feel your mixtures are too light, for the effect you are trying to achieve, just add more pigment. If they are too strong add more water. If after adding more pigment the mixture does not get stronger then you are adding more water to the mixture somehow. By the way, don’t forget to test your mixtures on a scrap piece of watercolor paper as it is very difficult to judge paint consistency just by looking at the mix in your palette. Now there will obviously be some exceptions to this, and I know that the explanation is not as simple as I would like to have made it, but hopefully you will find the above concept is a useful guide when looking at your own watercolor painting techniques. Have fun and please let me know if you have any questions. Really clear explanation of achieving depth in watercolour painting . Really helpful to me as a beginner . Many thanks Fred Montford . Finally, someone is talking sense!